The 60s were something else. We were desperate for change, tired of war, and looking for something to make call our own. Good times, good vibes, free love, and love bugs all stem from this truly unique decade. “Passing fads” still heavily influence today’s society – even though we’ve grown up a bit! Perhaps that’s why 60s-themed parties are still so popular. Its popularity doesn’t stop with us oldies, either. Even younger generations have latched onto the thoughts and ideas that came from the 60s. (Peace, love and understanding went on to influence the PLUR mentality of “candy kids”!) So if you’re looking for some great 60’s-inspired cakes for you next big party, take a look at the awesome designs we’ve found! This cake is a perfect example of the 60s. With the words “Love” and “Peace”, flowers, headbands, and pastels, it captures the more laid back rebellion vibe that the 60s rocked. 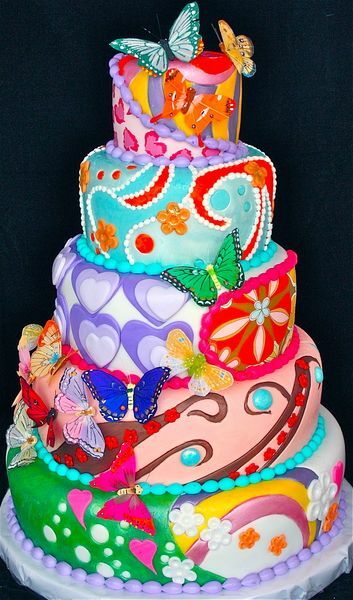 It may not be “beginner-friendly”, but it is an amazing cake that will compliment any hippy- or 60s-themed party! If your party is more relaxed, or maybe you have a little less prep time, this tie dye cake is perfect! If you want, skip the rainbow inside and opt for your favorite dark cake recipes. Whatever you decide to do on the inside, the outside will certainly make any 60s party pop! Possibly one of the most iconic things to come out of the 60s is The Beatles. There are so many cakes for this theme, it is crazy! The best part is, there’s one for every talent level – whether you’re just starting with cake decorating, or a real pro! This kind of iconic cake would make a great centerpiece for any 60s-themed party, and would match whether you want a more serious or more psychedelic look! If you want something colorful and full of so-loved patterns of the 60s, take a little inspiration from this cake! While it may look intimidating, and certainly takes a steady hand and some patience, it can easily be accomplished with a few extruders, fondant shape cutters, and lots of food coloring! If you want something that looks amazing but is simple to do, try out this cake, which was made using colored fondant cut into shapes and added to the frosting. While it may not be the most visually dynamic, the tunnel of fudge cake was probably the most popular dessert in the 60s. You can always use wax Mr. Smiley and peace sign cake decorations to make it keep with the theme a little more, or even skip the glaze and opt for some theme-appropriate frosting! There are so many fun 60s-inspired decorations and recipes that you can utilize to make your party amazing. And if you weren’t alive for the 60s, you should probably know that when it comes to food, the 60s were very go-big-or-go-home. If you can’t decide between two designs or recipes, just make them both! My name is Craig and I am an editor at CakeJournal. I spend most of my time finding every excuse to test out new baking recipes. I write about everything from cake recipes to fun baking projects to vegan baking. If you can’t get a hold of me I am probably out at a restaurant or in the kitchen!